I am in awe of bamboo. It is likely the most versatile and resourceful plant on earth. It’s reported that the list of things bamboo is not used for is shorter than the list of things it is used for! As virtuous as this plant is, in a home landscape setting, its reputation can be less than righteous. Imagine asking your neighbor for their permission to plant something in your own yard? Sounds absurd, doesn’t it? But, if you’re talking bamboo, planting the wrong type could unwittingly be the start of the next Hatfield vs. McCoy feud for as long as they live there! The stalks or ‘culms’ are fully grown in just a few months. With about 1,000 species growing around the world, the smallest reach a mature height of only about an inch while others top out at around 120 feet! Now fast growth is one thing when you want to fill in a space or provide some privacy, but when it rapidly encroaches onto your neighbor’s property, that’s another story. And this is where the potential problem comes into play. Many of the most common species of bamboo are aggressive horizontal spreaders as well. Bamboo is referred to as one of two types: running or clumping. Knowing the difference can signal the success or failure of your relationship when it comes to planting it! Running bamboo (momopodial or leptomorph) should be taken at face value! They run. I’m not sure even I can out run them! They are difficult but not impossible to contain, even though their underground ‘runners’ (technically rhizomes) race below the surface anywhere from 2” to 18” deep. Containment methods include cement, metal and high-density polyethylene plastic rhizome barriers. However, once they have breached the barrier they are a challenge to reel in. Non-invasive, clumping bamboo (sympodial or pachymorph) have short roots, 18” or less, generally forming discreet clumps requiring only a 3’ to 10’ circle of space to expand even at maturity; although their dense root structure can impose significant pressure on foundations, walls, fences and the like. They make attractive specimens and will form very dense screens albeit more slowly than their eager cousins. Clumping bamboos tend to be less cold hardy than the running kind but no matter where you live, there’s a species for you. It’s found naturally on every continent in the world except Antarctica. If you’d like to grow bamboo yourself, culturally it prefers rich, moist, well drained, neutral to slightly acidic soils. It is also partial to deep watering in soils with good drainage but can succumb to root problems in water-logged conditions. In cold weather climates plant bamboo after the danger of frost has passed. 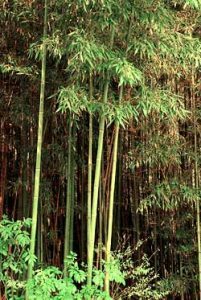 In very hot climates plant in late fall or early spring and in mild climates such as that of the west coast bamboos can be planted any time of year. Bamboo doesn’t have to be feared if you know what you’re planting before you start. If containment is an issue, take the appropriate precautions and proceed accordingly. Asking your neighbor for their permission? Well, that’s up to you. Thank you for the article! I have a “farm’ in Tennessee that is 30 acres. While it is fully fenced in barb wire, the dogs can run through that without issue besides losing a little bit of fur 🙂 The property is mainly hills and hardwoods with just a few acres that are flat. While I am not going to plant bamboo around the entire perimeter, I am going to do so with portions around our cabin area to try to keep the dogs from roaming. A few concerns that I have that perhaps you can answer: Is bamboo poisonous for any animals? I know panda’s eat it but I have a herd of deer that roam the property (and lots that come visit), along with the occasional coyote and a bear family that has left tracks by my small watering hole. Second: While I want to re-inforce my fence to keep the dogs in, I have a small year round stream that runs through our property and in front of the cabin. The property line (with nothing but undevelped woods on the other side for another 10 acres or so) will have the bamboo in front of it and it will be planted along the fence on both sides of the stream (the stream goes under the fencing). Will bamboo affect the stream and it’s ecosystem? Worrying because the person I bought the place from illegally cleared a lot of the trees around the stream and did some other “improvements” that changed the flow and caused flooding to the neighbor during the spring and high water events like lots of rain..
Randy, what a beautiful property it sounds like you have! Bamboo is not considered toxic to humans or animals. HOWEVER, the shoots do contain cyanide, a toxic poison. According to the ASPCA website and others, I find nothing about advising against planting bamboo as a risk to animal safely. But this is out of my realm of expertise. I urge you to do your own research to satisfy your query. As to question two, you’ve hit on another area that I’m just not qualified to answer. Sorry about that. But due to the nature of bamboo to spread, eventually it could alter the current natural flow. How that impacts future patterns is just not anything I can say with certainly. Too many variables there. Have you contacted your county extension service? Perhaps the State agency for the EPA, etc. I just don’t know. I wish I could be more help. I wish you all the best with this project. I appreciate that you are asking the right questions. I just wish I knew the answers. I’m looking for a bamboo to be a huge border against the road at my house. What type do you suggest and where done I buy it. It should be noted in BIG LARGE LETTERS ON THE FIRST PAGE OF ANY WEBSITE THAT ADVOCATES FOR PLANTING BAMBOO “IF YOU PLANT BAMBOO YOU MUST PLANT IT WITHIN A BARRIER!!!!!! So many websites suggest this somewhere buried in their website. Most people who plant bamboo do NOT put a barrier around it. I am tackled with a very expensive job of putting in a root barrier to control my neighbors running bamboo. She doesn’t do anything to control her bamboo. People who advocate for planting bamboo need to make it MORE THAN OBVIOUS THAT WHEN YOU PLANT BAMBOO YOU MUST PUT IN A BARRIER, ESPECIALLY FOR RUNNING BAMBOO. IT SHOULD BE TH E LAW SO THAT HOMEOWNERS WHO HAVE TO PAY THE PRICE AND TIME TO CONTROL THEIR NEIGHBORS BAMBOO, . IT IS INVASIVE, EVEN CLUMPING BAMBOO CAN BE INVASIVE IF NOT TENDED TO ALL THE TIME! ! TELL PEOPLE THEY MUST PUT IN A BARRIER!!!!!!!!!!!!!!!!!!!!!!!!! I think you are taking your frustration on the wrong person. I would hate to advocate poison but Roundup seems much cheaper than absorbing the cost of a barrier for a plant that is not even yours :). Or did she put in the bamboo to block you as a neighbor? Roundup is a Monsanto company and the front runner of GMO (Genetically Modified Organism), supporting such a company with our dollars is ludicrous. As ludicrous as having to dig a 2 foot barrier for something you didn’t even plant? The active ingredient in Roundup is Glysophate. Just go off-brand with anything containing a high percentage of that. Would it help clumping bamboo to stay contained to a narrow section if I lined it with an underground barrier? It can’t hurt but the beauty of clumping bamboo (in theory at least) is that it is more well-behaved so you’re not going to be dealing with runaway growth like non-clumping varieties. That said, your idea is not a bad one if you’re able. We have clumping bamboo planted in our backyard. If we cut or chop off new growth, will that stop the bamboo from more growths going that direction? clumping shouldn’t be a problem growing wildly outward. And cutting the tops won’t have an impact on side growth either way. My neighbor planted bamboo between our property lines. It has quickly spread to my proberty. I am not able to spend the money it would take to destroy it, if that is even possible. Do I have any legal options? How high does the tree have to be before i trim the top over my side. I have a ‘U’ shaped drive. I’m considering growing bamboo on the inside of the ‘U’ to provide some level of privacy, as both ends of the driveway lead onto a local busy/nosy roadway. What say you? Interesting idea. From a pure functionality standpoint, it would eventually achieve your objective with the right variety. Be prepared to have your bamboo take over that entire area eventually. Also, depending on the variety, it can get very tall and full. Perhaps that is what you want. But cars won’t be able to see the house and visa versa. I live in Zone 8 Dallas Texas. I need a non invasive clumping type bamboo that will grow about 15’20’to use as a privacy screen along the back of my yard, along the sides I need same type of plants that grow only 8-10′ feet high. What do you recommend? Our neighbors planted a large wall of bamboo to screen their home which towers over ours… and it is beautiful to look at. The PROBLEM is they have left it completely un- managed and as the sun comes from our direction their bamboo leans 6-10 feet over our home and front garden and the leaves obliterate our front garden and have actually caused large old growth plants to die, the leaves cover our entire front garden and door in a day! It also clogs our gutters so that my husband has to climb up on the roof at least once a month to unclog them. In addition the weight of the stalks swaying in the breeze have cracked the concrete wall between us and it is leaning over and about to topple. My husband has pointed this out to our neighbor (who by the way is quite wealthy and therefore able to hire gardeners to do their gardening) and they seem to feel no responsibility for the damage their plants are causing. We love our neighbors, but having to spend our precious little free time, fighting back their plants is taking it’s toll. DO NOT plant bamboo if your home is less than 10′ from your neighbor- it is really unfair! I hear you!!! I have neighbors with bamboo and causing me the same issues as you. It is ridiculous, frustrating and not fair that they cause us more yard work. They have approximately 30 stalks that are at heights of 40 to 50 feet or more, and yes, leaning over my house. I have been able to get the HOA to force them to fix the wooden fence that is destroyed every 3-4 years. And get this, these neighbors are mad at me for making them do something, costing them money. OMG, really?!?! HOA says they can’t do anything about getting the bamboo trimmed or taken down. These stalks are so high I can’t reach them to cut down what is hanging over my property. Thinking of taking the legal route, but not sure if that will work. i planted bamboo, but it is a runner, if i dig up the plant this summer, will the roots will grow new shoot? or will it die with the plant not being in ground? Take the main plant out along with all the roots you can. Then keep an eye on any new growth emerging from roots you miss. If you can attack this early, you should be able to eradicate the remaining chances of new growth. But do keep close watch before it gets away from you. Good luck. Bamboo does not die so easily. You’ve got to block sun & water from ground above roots until root system dies. I live in Michigan and am looking to create a privacy wall. Our homeowners association doesn’t allow fences, so I was thinking of creating a fence with plants. Our houses are very close together, so I don’t have a ton of space to work with. Do you think doing bamboo in a few large planters would work? Since I’m in Michigan, would this be something I would have to plant every spring? I think bamboo in planters would work. You’d have to check with your local extension service or nursery to find varieties that work well in your area and survive the winter. Also, do you plan on putting these planters on concrete or other impervious surface? That would be best. Otherwise you’ll need to keep an eye out for the runners that that will invariably escape the drainage holes and send up new shoots. You’ll just need to stay on top of that to control it. Or, find clumping varieties that don’t run. That would be safest, especially if you are setting containers onto soil. I have several varities of clumping bamboo in Bradenton, FL. Its all right on property lines. If it grows on the wrong side of property line, just break it with your foot while its small. The bamboo “learns” not to grow in that area. Ive done this with bambusa lako (black bamboo), bambusa oldhammi (giant timber), buddha belly, etc. It now only grows on my side of the fence! Thank you so much for this article! I want to plant bamboo for privacy but don’t want to make work for my neighbors. The options are helpful. Hi. I live in the rural part of upper Michigan We have like 5 or more acres that is flat land. So I would like a fast growing cold hardy bamboo. Any idea of what kind to plant ? And where to buy it from. Joe, thanks so much for your article. It is very helpful! I was hoping to plant bamboo as a fence in a narrow bed lined with landscaping cloth and bordered with bricks. Would this be enough to keep the bamboo from spreading? It could help but won’t keep it from eventually spreading. If you’re going to start a row of bamboo, then one of the best things you can do is stay on it and always continue to sever the expansion or knock off the new shoots that will start emerging. The key is to stay ahead of it. And that’s the risk too. You just never want to let this get ahead of you. It’s not the end of the world, but def. a lot more work later. It’s MUCH easier to keep an eye on it and catch it early. Hi Rachel. Bamboo in large metal containers, like horse troughs would work. But you need to drill holes in them for drainage. Eventually, you may find that the bamboo has “escaped” through the holes and is starting to spread. As long as you can keep an eye on this and stay ahead of it, you shouldn’t have a problem. That will be the key and your biggest challenge down the road. But containing it as you propose will make a huge difference in keeping it at bay. My entire property is on a hillside. Can bamboo withstand the slope? Surely it can Donna. You just have to get it established and let it run after that. Hi Joe. Your article is really informative. You have described the problems associated with planting bamboos in the garden yard. I was thinking to create a bamboo fence on my terrace for privacy. So is there any possibility to spread out if I plant them in a large pot? As long as the pots stay on the terrace you should be fine. Even in pots, there’s a hole in the bottom for the roots to go. But in your case, no place to go to. So you should be fine in pots. if you were placing these on soil somewhere, that would be a different story. So our neighbors hate us anyways and actually have security cameras into our yard. Which is the best to plant that grows fast? And I don’t care if it encroaches their side, they have cut every thing that gave us privacy. I want to shut out their cameras but also want to perhaps build a cement case to keep from growing too much into our own yard. Ideas please? nikki. Bamboo came to mind first, before I even realized you were posting from the bamboo article. I don’t know where you live so it would impact what I suggest. But there are bamboo varieties for every part of the world almost and fast growing too. It’s sill my first choice no matter where you live. Otherwise, contact a local nursery or your county extension service for suggestions on a fast growing evergreen for your area. Be sure to specify if the area where it is growing will be in sun or shade. I live in southern florida what’s the best, fast going bamboo for a fence? I live in Southern Minnesota. I am looking at bamboo more for its versatility than privacy screening. Any thoughts about the species Phyllostachys nuda? Are the shoots edible? Is it toxic to my neighbor’s pets? What is the growth rate for this particular species of bamboo? Because of the colder climate, will this affect the rate of growth? Any help/information would be greatly appreciated. My neighbors have planted an expensive clumping type of bamboo and it has devastated my hill country view. I have been topping the bamboo that has invasively shot up. While I totally respect my neighbors desire for privacy, they now insist that I allow their bamboo to reach its natural heighth. We are swiftly approaching the Hatfield and McCoy stage. I was informed that if their actions impact the value of my property than I have cause to sue for compensation based on property value loss. I am sickened and am looking for advice. So what type of bamboo can you grow for privacy that will not invade your neighbors yard? I live in the Texas hill country and have a 50 foot fence line that I need to a privacy row. We don’t get a lot of rain here. Hi Susan. I am not sure of the varieties of bamboo that would be best for this in your area. But my suggestion is to contact your local county extension office for specific bamboo varieties that would work for your Texas hill country. Just a note for you to gain another perspective, I planted clumping bamboo but my neighbours hated it and me because of the leave that is drops. What about planting in large containers, say 2-3 feet tall pots? Will it spread out of there. Was thinking of a privacy fence. I love large containers Bob. Lots of options here and the containers give you more flexibility. But, the downside is, they require much more watering since they tend to dry out much faster. I suggest you put your containers on a drip irrigation system on an automatic timer to take the worry out of it. Otherwise, go for it! Kayo. There are many varieties of bamboo and it will be important to make sure the kind you buy is the clumping type if you want to keep it in check close to your house. The flower bed can help contain roots but running bamboo is aggressive and will find a way to “escape” unless it it completely contained. You will need to check the tag on the bamboo and verify through a trusted source or research that you are buying what you want. My bamboo plants have surrered frostbite due to unusual snow this winter. Will the dead leaves fall off and sprout new again? Or do I have to dig up to replace?